Located in downtown Homer on Historic Homer Highway (US Business 441) at the intersection with Yonah-Homer Road. Construction began in 1859, but wasn't completed until 1863 due to delay related to the Civil War. The structure is made of bricks cast from the mud of a nearby river. It is considered a prime example of Greek Revival architecture. 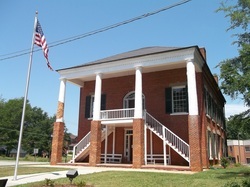 In 1980, the courthouse was placed on the National Register of Historic Places (#80000969).